For OMers working in Angola, the key to successful ministry has been time investing in relationships. Joao, a native Angolan and a gang leader in the town of Menongue, Angola, was 8 years old when Wessel and Joan van der Merwe moved to Angola to pursue full-time mission work. In a country of millions, the odds of the three running into each other were small. But God does not deal in chances. As Joao grew into adulthood, Wessel and Joan—as representatives of OM—were hard at work, though not by traditional missionary definitions. As ESL teachers for the first several years of their ministry in Angola, the couple built relationships and made connections, navigating around various cultural blocks that many find in Angolan life. The fruit Wessel refers to is not only connections with high-end government officials and other legal and corporate relationships, but it is also found on a day-to-day level in the innumerable friendships both of them enjoy, from shop owners and bakers to local teachers and pastors. “It took us almost 10 years to get through this. We needed to get it perfect,” Wessel explains, and Joan adds that the challenge of taking time with the Angolan people has meant a lot to her. When Wessel and Joan did begin their missions training programme in 2013, they had only one student, but beneath the ministry itself, a foundation supported their work. In 2016, the programme welcomed Joao, who had a miraculous testimony of healing and deliverance. After coming to Christ in 2014, he became a faithful attendee in Joan’s discipleship group, and eventually he committed to missions training with his parents’ blessing. Now Joao has planted a church in Menongue, where Wessel and Joan continue to help guide and support him. In 2017, the OM Angola missions training programme, in its fifth year, welcomed 17 full-time students (an 18th participant completed a portion of the programme). The programme is one year long, followed by six months of practical work, after which the students receive a diploma of graduation. While other missions programmes in OM Africa are three to six months, Wessel says a year-and-a-half programme is necessary in the cultural context of Angola. Most of the students come from Angola’s capital, Luanda—a metropolis known for its expensive lifestyle. Because large oil companies have brought a western influence to Luanda, even local Angolans from the big city have trouble adjusting to life at the OM base in Menongue. They arrive at OM Angola’s 30-hectre (74.1-acre) plot by dirt road, where they settle into life with Wessel, Joan and the rest of the OM team. The buildings on the property are made of clay, which Wessel says is important, because their desire is to blend in with the surrounding community, even after more than a decade of building relationships. It’s also important, Wessel says, that they “live together,” as building relationships with the students is essential. So Wessel and Joan have a room next to the kitchen and dining hall, where the students gather to eat. Just as the foundation of their ministry in Angola is made of relationships, so the missions training is not so much a programme as a community. And in turn, that community lays a foundation for effective kingdom work. 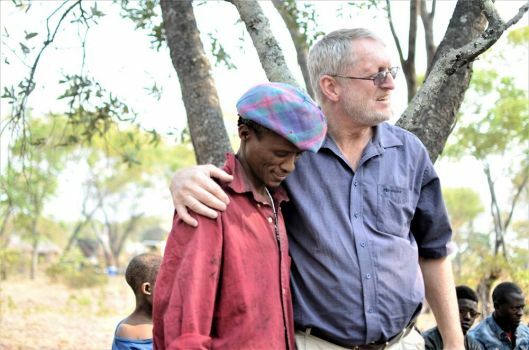 The missions training programme also spends a week with the bushmen of Angola near the end of the year, adding practical missions experience to the theological training. As a result, the students are better equipped to take practical steps when they head back home for the final six months of the programme. But even as they begin to reap the benefits of their labour, Wessel and Joan are thinking about what kind of legacy they will leave.